The Blame Bertsch Band is an Americana-Folk rock act from Cincinnati, OH. TBBB plays original as well as cover songs from The Band, Little Feat, Bob Dylan, Led Zeppelin, Ray Lamontagne, The Avett Bros, etc. Their infectious foot stomping sound and style will rock any establishment, party, or gathering. Great Music and they stayed later than they were booked! I booked Gary and his group for the 2018 Greenhills Harvest Fest as our headliner and although I was too tired to stay to hear them play I was given rave reviews from our volunteers and committee about their performance! One of my council members told me that they sounded great, the crowd was really enjoying the performance, dancing along and that the band even stayed 45 min longer than they were booked to perform! I really appreciate how great these guys were to work with and knowing that our crowd was enjoying them! My only regret was not getting to hear them myself. Thank you so much to Gary and The Blame Bertsch Band for a great performance! Great music & great people! My company hosted a catered brunch benefiting a charity organization on a windy, rainy day. Despite challenging weather conditions The Blame Bertsch Band got their gear set up quick & provided energetic accompaniment for our event. They're professional, friendly, and most importantly talented. I recommend them highly for any occasion. Price Range: $450 and up. Gary Bertsch and Dan Walsh have been performing in the Northern KY/greater Cincinnati area for over 20 years. They have brought their musical talents together to form The Blame Bertsch Band. Their influences include: The Band, Little Feat, Tom Petty, REM and The Black Crowes. 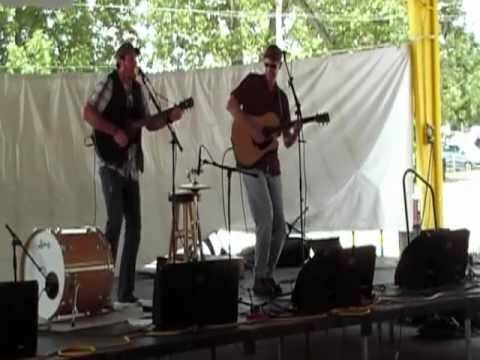 Their acoustic/percussive Americana music is inspiring and soulful with story telling as they mix traditional rock and roll with folk and a splash of country to form their unique sound. Their album, Blame Bertsch, was released in July, 2012. Bill Thompson of WNKU had this to say about their new release, "The CD shows that Bertsch has learned his folk-rock lessons well. He harmonizes nicely with Walsh, who adds spicy slide licks on multiple tracks." Blame Bertsch has recently performed at Summerfair Cincinnati, the Browngrass Festival in Rabbit Hash, KY, the Alexandria Fair Kickoff Celebration concert, and Maifest and Oktoberfest in Covington, KY. The Blame Bertsch Band consists of guitars, banjo, and percussion. We can strip down to acoustic only instruments if needed. Folsom Prison Blues - Cash Sin City – Flying Burrito Bros. Hide Your Love Away – Beatles Oh Sweet Nuthin – Velvet U. Squeeze Box - Who Friend of the Devil – Grateful D.
The Band, Bob Dylan, Led Zeppelin, Little Feat, Johnny Cash, Graham Parsons, Tom Petty, REM, The Black Crowes.